The 2017 Kawasaki Z125 PRO is the bike to conquer the city, regardless of your riding experience or how much gas money you have in your pocket. Built with an emphasis on fun, the Z125 PRO is designed to amplify the thrill of riding. The Z125 PRO is a visually striking motorcycle with styling that’s a little on the dark side. It not only has edgy looks, but it's also a blast to ride. It fits into that perfect package for those desiring a small, pressure-free motorcycle with plenty of capabilities, low price and great gas mileage. Ideal for someone looking for a real motorcycle, but without the high pressure and costs associated with a larger bike. Thanks to the performance-oriented suspension, easy maneuverability and high fun level, it’s also a motorcycle you won’t soon outgrow. The Z125 PRO was built for the pureness of the riding experience. The Z125 PRO, the newest member of the Kawasaki Z family, is unique in that it was designed for two seemingly opposing targets in the motorcycling market: both beginner riders and veterans alike. The Z125 PRO is great for beginner riders who want a real motorcycle without the intimidation, high seat heights or expense. The Z125 PRO is also great for those experienced, fun-loving, thrill-seeking riders who want a second bike to ride around town or through the pits at the local racetrack. It’s the dark side of fun. With a user-friendly seat height of 30.7 inches and a low weight of 224.8 pounds, the Z125 PRO is one of the lightest and nimblest road bikes you’ll ever own. Its light weight and low seat height also makes it easy for almost any rider to maneuver. The Z125 PRO’s chassis is designed to accommodate two-up riding and with the large 2-gallon fuel tank, it’ll keep you on the road longer between fuel stops. 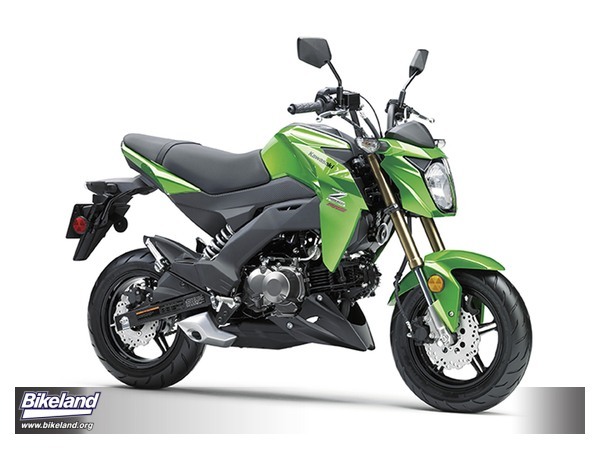 The Z125 PRO is the youngest and smallest member of the Z family. As the younger brother, it features many of the fun characteristics of the US Z lineup, which consists of the Z800 ABS and Z1000 ABS. Features include a stylish headlight design along with user-friendly but aggressive bodywork that make for a dark side attitude. That sporty, single headlamp design also contributes to its slim image. The multi-reflector headlamp throws a clear beam of light, facilitating night-time illumination. Compact engine shrouds contribute to the bike’s hourglass figure as well as its overall aggressive design. The side shrouds also offer a degree of wind and road Protection. The ignition switch is located, à la Z, at the front of the tank, adding to the bikes’ sporty, image and a tidy cockpit design. The new Z125 PRO’s single-cylinder, 4-stroke SOHC engine displaces 125cc thanks to its oversquare bore 56.0 x 50.6mm bore and stroke. The 125cc engine is tuned for street riding with an exciting and sporty, yet easy to ride power delivery. Unlike most small-displacement engines, the Z125 PRO features digital fuel injection with a 24mm throttle body, for smooth operation and quick starts every time. The 2.6 liter air box is positioned above and forward of the cylinder head, contributing to the sporty power feeling and helping to minimize intake noise. Cam profiles and intake port design also contribute to the smooth, quick-revving engine character, as well as stable idling. 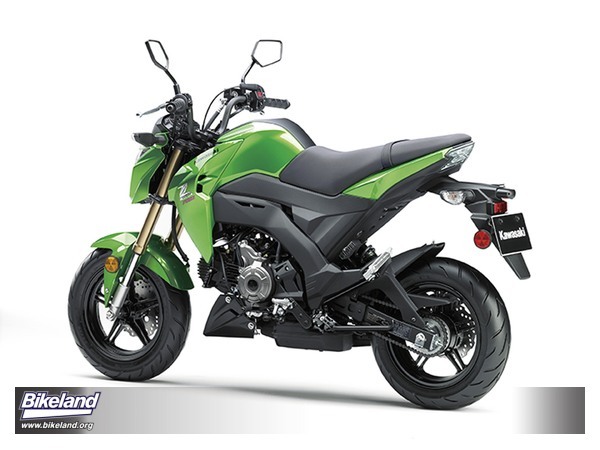 The Z125 PRO has easy, consistent starts thanks to its electric start, digital fuel injection and the Kawasaki Automatic Compression Release (KACR), which utilizes the exhaust valve to release cylinder pressure during starting. The engine is mounted low and forward in the frame, making for the best weight distribution possible, and adding to its already nimble handling. The intake is mounted high and the stainless steel exhaust mounted low, while both are fixed in the center of the chassis, adding to the compact design and balanced weight distribution. The Z125 PRO uses a traditional four-speed transmission with a manual clutch and traditional clutch lever. It has a very easy, light clutch-lever feel and positive engagement. Shifting comes through a link-type shifter lever very similar to that of a full size sportbike, only that the Z125 PRO’s shift lever requires little load pressure to engage, another major plus for first time riders. The compact chassis, along with sporty suspension and tires, enable riders to enjoy the light, nimble handling one would expect from a Kawasaki Z. Up front are the aggressive 30mm inverted front forks, which shows you it means business. The forks feature 100mm of stroke and excellent rigidity while keeping unsprung weight low for sporty riding. Up top is a lightweight aluminum upper triple clamp. The single shock rear suspension is offset for a compact package and sporty handling. The shock’s mounting angle is optimized for the Z125 PRO to ensure superb shock action and great ride comfort. The rear shock has 4-way preload adjustability, allowing for riders to set the preload for their weight or to accommodate a passenger. Contributing to the sporty characteristics and looks are the 12-inch cast aluminum wheels, which cut down on unsprung weight and are wrapped in 100/90 and 120/70 tires front and rear. The tires sizes and tread pattern were chosen to optimize the Z125 PRO’s light and nimble riding characteristics. The Z125 PRO is built on an all-new, high-tensile, steel backbone frame with tube diameter that ensures sufficient strength to enable two-up riding. The frame backbone measures 48.6mm in diameter and is supported by 25.4mm lateral tubes. The rear frame tubes are 22.2mm in diameter. The Z125 PRO also features a highly rigid box-section swingarm. With the introduction of the Kawasaki Z125 PRO, Kawasaki continues to Provide offerings for riders of a variety of ages, budgets and experience levels. The Kawasaki Z family features a variety of great, fun and exciting to ride urban motorcycles. Rake / trail: 26.0 degrees / 2.7 in.